Fencing Equipment Used. Condition is Used. I don’t know much about this equipment although it is used and has been washed. This is Uhlmann's non-FIE class jackets is comfortable. All sizes for Uhlmann jackets are Euro size. Size 40 available. This is Uhlmann's non-FIE class jackets is comfortable. All sizes for Uhlmann jackets are Euro size. Size 38 is available. These are 2 DEMO weapons that may have been used once or twice. 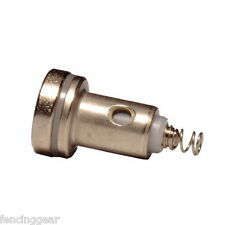 Show Minimum wear and are tested for functionality. 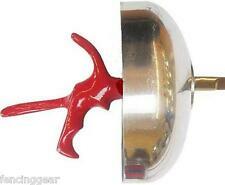 Products are LEFT HAND daggers for RIGHT HAND Epee fencers. 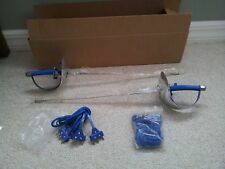 The "Y" style body cords connects to the electronic scoring equipment, the electric dagger weapon and the epee for 2 weapon fencing. I would use this for display only. Quite collectible! Inventory Number 7980. Good condition for its age. The mask has areas with moderate to severe staining and wear. DURABLE 100% COTTON MADE IN USA JACKET WITH VELCRO OPENING FRONT. Double-layered neck protector "blade catching" collar. Absolute Fencing AF Helmet Mask Size Large CE 350 N. This is in good used condition. It’s very clean but does have initials written on it. This is new, never worn, Negrini epee fencing mask, size L.
You're buying the bag in the pictures. This is a standard storage tote/bag by Absolute Fencing Gear. Used, but pretty well taken care of. Clean overall with just minor signs of use. Features a jumbo zipper for easy access when you have your gloves on. Excellent working condition! Has minor signs of wear from normal use. Item has been thoroughly cleaned. If you have any questions let me know! Thanks! Please see pictures for most accurate description. Payment is due within 24 hours of purchase. Please review the pictures and information carefully. I do my best to thoroughly and accurately describe all my items, but I'm human! So if something is overlooked or inaccurate, let me know BEFORE contacting eBay, so that I can make it right. OPPORTUNITY TO MAKE YOU 100% SATISFIED WITH YOUR NEWLY ACQUIRED TREASURE. EXCELLENT CONDITION! Vintage Castello Fencing Foil Sword Castello Mask Foil Lame Vest Glove NYC USA & Leather Glove NYC USA. Sword is 43" end to end. Lame vest is Metal Mesh Size 40. Mask has no size but looks to fit a men's regular. Four pieces. All Vintage. See Pics. Sword has Surface Rust. Guard is well used. Mask does have some rust on rivets. Mesh looks good. Vest looks in good condition. Selling as a lot of 4. Please ask any questions. Thank you. Fencing by RH Behmber, published by Arco Publications London ,1965.97 pages with section of B&W photos. Hardcover is in very good condition with minor scuffing top and heel of spine, Dust Jacket has small tears at top and heel of spine and corners and scuffing, stains and creasing on front and back. More than 30 years ago my Dad tried his hand at fencing, this was his mask. 10" and Temple to Temple 9". Used Uhlmann fencing cord, spool with 50 feet of cable. Inventory Number 8280. The handle is wrapped with leather. Quite collectible! Worn by my son for less than 6 month - grew out of it and got another Carmimari. Neither my son nor my daughter would fence in anything else but Carmimari. The jacket is in excellent condition, will serve you for years. 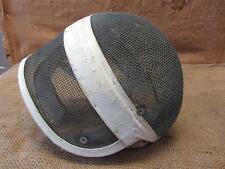 Blue Gauntlet Fencing Mask level 1 size M.
Vintage Uhlmann fencing swords. Swords are showing rust. These have been used as a mantelpiece for the past few years. See photos to see the condition of the swords! Fencing With The Electric Foil ,Faber and Faber, London, 1961. Hardcover condition: Very Good with light stain running down front cover. Dust Jacket Condition: Poor, large pieces missing, multiple tears. Inventory Number 8281. The handle is wrapped with leather. Quite collectible! 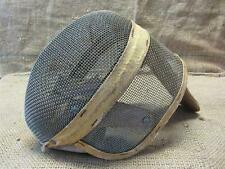 Vintage fencing helmet with neck guard. Castello? Santelli? Very cool! 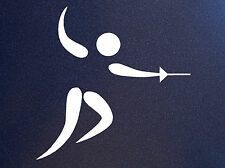 Hello everyone, especially those interested in the sport of fencing. This is in great condition and looks very old. It has the neck guard piece and the padding is intact. VINTAGE FENCING MASK HELMET NICE! For sale is a pre owned VINTAGE FENCING MASK HELMET that is in good condition but does show signs of wear. It is missing on of the button snaps. 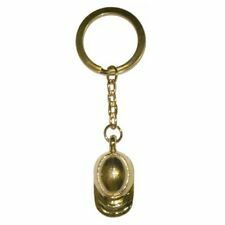 Please take a look at the pictures of the actual item you will receive and ask any questions that you may have. Image 3 and 4 Zivkovic electric competition saber and foil with KII pistol grip. the Jacket is Front close. image 2 triplette fencing gear bag. image 6 Glove is right hand. Tripplet Fencing. image 7 is 4 fencing socks, 2 body cords. Worn by my son for less than 6 month - grew out of it and got another Carmimari. Neither my son nor my daughter would fence in anything else but Carmimari. The breeches are in excellent condition, will serve you for years. Good starter kit. My son outgrew this, but maybe it's just right for your child. Blue Gauntlet fencing bag. dark green, heavy canvas material. bag is in very good condition. All show serious wears.Blue gauntlet helmet shows serious scuffs on the rim.Outfit not clean and show stains.The pants (size M)shows serious stains and a name. Level 1 jacket (size 51 Europe size) collar and sleeves rims show yellow stains Blue gauntlet top size L op sport econo guard size m linea mask 350 nw France shows ink numbers and stains. m003 bg olympic level 1 helmosize L See photos Sold as is . PLEASE DON'T LEAVE NEGATIVE OR NEUTRAL FEEDBACK! WE STRIVE TO KEEP OUR BUYERS HAPPY! IF THERE IS AN ISSUE WITH YOUR PURCHASE, PLEASE CONTACT US BEFORE LEAVING NEGATIVE OR NEUTRAL FEEDBACK! POSITIVE FEEDBACK IS ALWAYS APPRECIATED! ☆Please feel free to ask questions at any time for any reason, I'll be more than happy to answer them to ensure your satisfaction when your item arrives☆ ■CONDITION: PRE OWNED Comes as pictured! ■FLAWS: ■SHIPPING: PAID BY BUYER Items will usually be shipped the following business day before 12:00am, on some occasion's we are able to ship it the same business day before 10pm. Items over $100 will be required to sign. In most cases items are shipped priority through USPS. If its under a pound it will go Firstclass. If it's a heavier item Fedex home delivery will be used. Fedex does not deliver to PO Box. I have an SG Fencing mask for sale. DETAILS: As you can see from the photos, this fencing mask is in great shape and shows normal signs of use. SIZE: small. You will be receiving the exact item you see in the photos. Mask seems to be in good condition. Top is a 21002 G Back Size 34. Glove Size Small. Vintag Fencing helmet. Santelli? Castello? Very nice! LEON PAUL F100 ELECTRIC & EPEE INSULATED FENCING MASK / HELMET SZ SMALL USED??? This is a good condition, possibly has not been used, Fencing mask made by Leon Paul. This is the F100 Electric and Epee Insulated mask. This is a size Small. I would use this for display only. Quite collectible! Inventory Number 7713. Good condition for their age. The mask have areas with moderate to severe staining and wear. BLUE GAUNTLET FENCING PANTS LEVEL 1WHITE WOMAN 26. BLUE GAUNTLET FENCING ONE SIDE JACKET SMALL R/L. BLUE GAUNTLET WHITE FENCING JACKET WOMAN 36 LEVEL 1(NOT PICTURED)ZIPPERED. 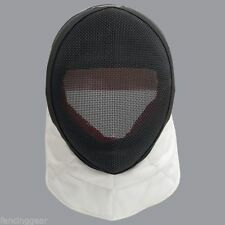 X-CHANGE FIE TRADITIONAL EPEE MASK. The FIE X-Change original Epee mask isthe choice for high level fencers. The lightest, most breathable fencing mask available,featuring a unique patent that makes it fully washable and easy to upgrade and renew parts making it future-proof. Gorgeous antiqueépée (fencing sword). Markings include "FRANCE" "G 9" "5"?. on one side. The other side is marked with "FRANCE" "Made in France" and a makers' mark which may be "PR" set in a sunburst style circle. This one is in Fair condition as shown. All are new. 2016 type I doesn’t have a bag but there are no stains!